THE HEALTHY ENAMEL THAT COVERS YOUR TEETH is the hardest substance in your body… It's even harder than your bones! That's great news when you consider the amount of pressure our jaw muscles exert on our teeth. However, your teeth can still be cracked and chipped. Here are four "don'ts" for avoiding a cracked tooth. High powered blenders have special blades and settings for crushing ice. So imagine what chewing on ice can do to your teeth! Some people do it out of habit—and others do it when they're nervous or bored. Just stop! It can chip or crack teeth. Hard candy isn't good for your oral health anyway. Besides the high sugar content, and the long periods of time the sugar sits on your teeth, hard candy can also crack your teeth. 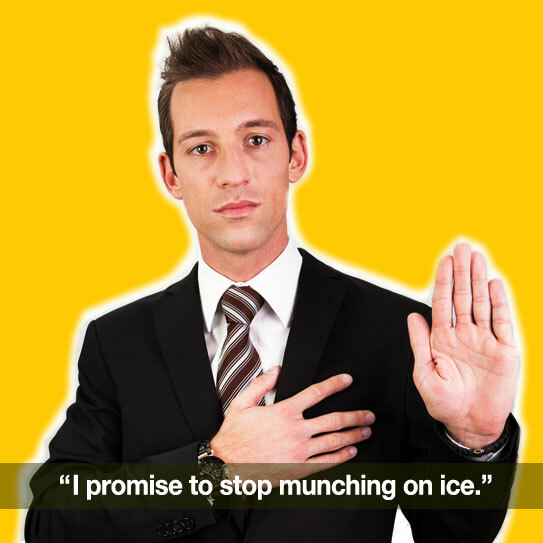 Jawbreakers, suckers, and frozen candy bars are common culprits. If you enjoy these occasionally, consider licking them instead to avoid damage. We know that they're difficult to avoid! When you're enthralled in a movie, the last thing on your mind is the popcorn you're enjoying. Just try to be aware of those pesky unpopped kernels! They're not bottle openers. They're not scissors. They're not pliers. You get the idea. Together, we'll figure out the best course of action.